MINI Cooper Acccessories + MINI Cooper Parts :: OutMotoring.com MINI Blog :: MINI Lifestyle :: ICE ICE MINI? I thought MINI had reached to every corner of life to find ways to get their brand in our daily action but I was wrong when this came in the door. 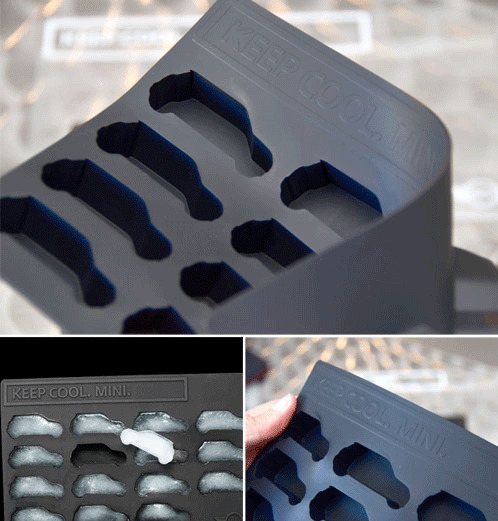 Enter the MINI Ice Tray. With these at your next get together you'll likely get a few chuckles and fun loving comments such as "hey, these are about as big as your car" or "ice, ice, baby", or maybe even a "you love your car too much and we're gonna leave because you're kinda weird". In any case, hopefully having these at your part will not cost you your social life but will actually make you EVEN more COOL than you were before. Comments on ICE ICE MINI?